When designing software, effective use of design patterns can simplify your design, save you time and produce results more quickly. In the following posts I will be demonstrating the implementation of one the Gang of Four’s frequently used patterns, The Command Pattern. an object is used to represent and encapsulate all the information needed to call a method at a later time. This information includes the method name, the object that owns the method and values for the method parameters. Encapsulates a request as an object, thereby letting you parameterize clients with different requests, queue or log requests and support undo-able operations. Now we have a definition of the pattern, I will explain the project brief. The idea is to code an API for a Home Automation system, operated by a hand-held remote control. The Remote Control will be able to control any household appliance through a simple interface; seven pairs of on/off buttons, plus an undo button. Each pair of on/off buttons will allow one particular command to be activated and deactivated. As the pair of on/off buttons have to correspond with the same command, I will from now on refer to them as a “command slot”. The Remote Control has seven command slots. The appliances will be likely to change in the future with new features added to them. Additionally, new appliances may be added to the house. The changes in the appliances should not cause us to change code in the remote control. The user will be able to add and remove the command in each command slot during run time. The undo button will undo the last action performed. The Remote Control Object is the Invoker in this pattern. When a button on the Remote Control is pushed a command object execute() method is invoked. The appliances are instances of the Receiver in this pattern. Calls to a receivers methods are made by instances of the command objects. The House class is the Client in this pattern, which instantiates and holds references to both the Remote Control and the Appliance objects. There is only one Remote Control per house. At this stage of the project the receiver classes all must have parameterless constructors, as well as an on and off method along with a publicly accessible boolean property representing the state of the object (either on or off). By using this design pattern, the Remote Control is decoupled from the Command Objects and the Appliances. The first four classes are CeilingFan, GarageDoor, Light, and Stereo. The on() and off() methods when called, do what their names suggest and update the boolean field _isOn accordingly. 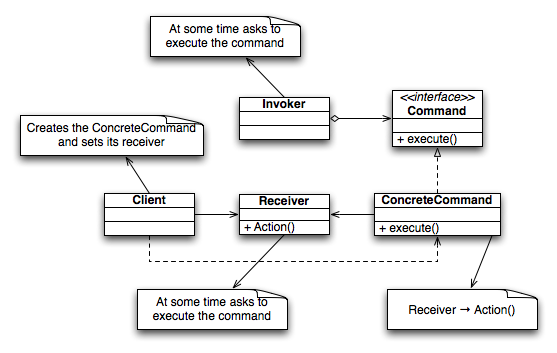 All Command Objects implement this interface, and are responsible for executing methods in the receiver classes. execute() invokes a method or methods in the receiver class. undo() invokes a method or methods in the receiver class that does the logical opposite of whatever the execute method does. 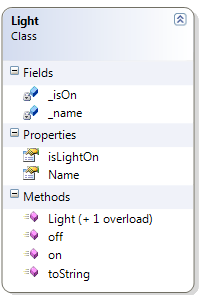 It’s constructor must be passed a Light object as a parameter, which is stored in the _light field. When the execute() method is invoked, it calls the on() method of the _light object, and the undo() method when invoked calls the off() method on the _light object. Because the Receiver object being called has only a binary state which is toggled with the on() and off() methods, this command is very straightforward. In a latter we will introduce a more advanced use of state in Receiver classes. 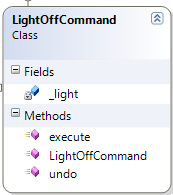 As you have probably guessed, this class is the corresponding “Off” command for the previous Command Class. 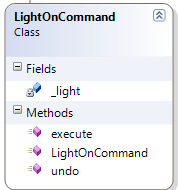 This time, execute() turns _light object off, and undo() turns the _light object on. Another Concrete Command Class used in the application is NoCommand, which acts as a Null Object. Its execute() and undo() methods don’t do anything. Null Objects are useful because we want to keep the Remote Control class simple and loosely coupled to the Command Objects; by using NoCommand as a Null Object, the Remote Control class does not have to handle a null value. For instance, when a Command Slot has not been set to a specific Command Object, a NoCommand object can sit in the slot. This saves the Remote Control needing to check if each Command Object is null before it attempts to calls its execute() method. The Remote Control is created with each command array populated with NoCommand objects, the House object uses the setCommand() method to add them. Available_Slots and CommandCount properties are used by the House class to determine how many slots are unassigned in order to assign new commands. When the onButtonWasPushed(int) and offButtonWasPushed(int) methods are called, they look up the command object stored in the respective _onCommands or _offCommands arrays at the index passed in as the parameter. The execute() method of the command object is called. The Remote Control does not need to know what the command does or how it works; it just needs there to be an execute method to call. It is decoupled from the Command Object. The Command Pair struct represents a Command Slot, a pair of commands objects which turn on or off a single appliance. _ArrAppliances holds an ArrayList of the Appliances. _commandsArry holds an ArrayList of Command Pair structs, which are all the valid commands for the House object. Appliances is the read only ArrayList of _ArrAppliances. CommandList is the read only ArrayList of _commandsArry. 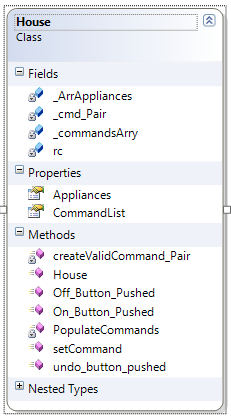 The PopulateCommands() method creates the valid appliances for the house and the command objects that control them. As we want the house class to be loosely coupled with all the appliance classes and the command objects, I have written the code so these objects are created dynamically at runtime, using Reflection. In order to do this, the Command Objects need to be defined outside of the code. I have chosen to store this information in a SQL server database, although storing the data in a XML file would be equally valid format. As I am using LINQ to SQL, the syntax does not have to change much in order to do this. The four attributes retrieved from the LINQ query contain all the information for the createValidCommandPair() method to create a Command Pair for a single Remote Control Command Slot. 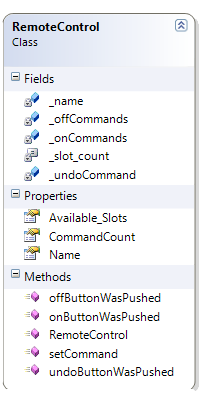 Below is a row from the Command Object table. Using reflection, the receiver object paramType is created and then passed as a parameter to both the ICmdOnObj ICmdOffObj constructors. The object paramType is then stored in the _Appliances ArrayList. Both Command Objects are set as Properties in the slot command_pair, which is then returned to the PopulateCommands() method. The PopulateCommands() method then adds each of the new command_pair structs to the _commandsArry ArrayList. This design for the Appliances and Command Classes are decoupled from the Remote Control class. Commands Pairs are defined in a database, which means they can be altered at runtime. For instance, if one needed to create a new Command Pair for a new appliance, one would just need to add its definition to the Command Objects table. T-SQL script to create the Command Objects table can be found here in my Subversion repository, along with the script which populates that table with data to create the Command Pairs. In order to use LINQ to SQL the user will have to a new DBML file to the solution, with named “RCDatabase.dbml”, and add the CommandObject table to file. The details of the database schema and how LINQ to SQL is used in this project will be covered in a later post.